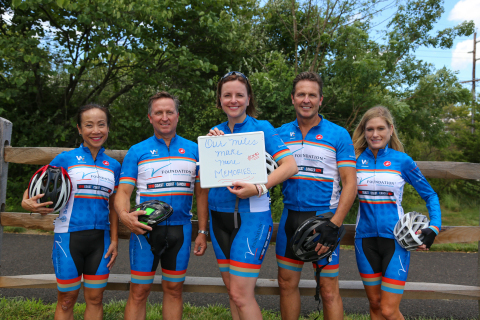 PRINCETON, N.J.--(BUSINESS WIRE)-- Today, for the fifth year in a row, Bristol-Myers Squibb Company (NYSE:BMY) is launching Coast 2 Coast 4 Cancer, a nearly month-long cross-country bike ride to raise money for cancer research. From September 5-25, 109 company employees will ride a total of nearly 3,000 miles from Cannon Beach, OR, to Long Branch, NJ with the goal of raising $1 million for the V Foundation for Cancer Research. Funds raised will be matched dollar for dollar by Bristol-Myers Squibb Company, up to a $500,000 maximum donation.